Calories in olive oil: just how many are there? Find out how many there are in different everyday measures such as a tablespoon or a teaspoon, or in a 100 ml, together with the calories in butter, lard, and sunflower oil etc that you might otherwise use in your cooking. The photograph at the top of the page is of organic "Olio Extravergine di Oliva Toscana" - extra virgin olive oil from Tuscany - and was taken at my local olive grower and olive oil producer - Frantoio Stanghellini, during this autumn's cold press extraction. 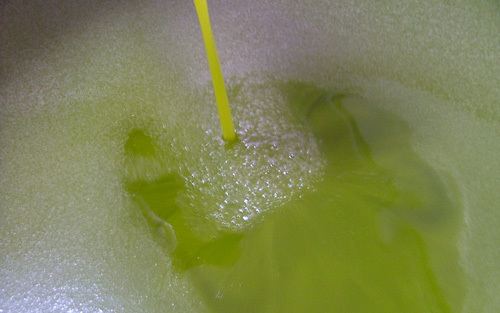 To find out more about Frantoio Stanghellini click on this Frantoio Olive Oil link, or to see the extraction process in photographs click on this Picture of Olive Oil link.